August 2017 – I'd bookmark that! 1.Cross curricular site. Another great site in the series from guest contributor Caroline Dwight! I took the Gapminder test and I am definitely one of those people who has a lot of misconceptions about basic global facts. 2. Biology. I’m not gonna lie, I have absolutely no idea what I’m looking at here or if it will be of any benefit to colleagues in the Biology field. But here you go anyway! The Brain Atlas! 3. I know that this coding and search ability is becoming increasingly important, but even after the video tutorial explanation I struggled to get my head around this site, BUT it sounds important for future us, so past me is saving it here! 1.Health – This is very cool. You can choose male or female, highlight the muscle area you want to work, then choose between Exercises, Stretches, and Bodyweight. Then a series of videos pop up that show best practice! Fantastic! 2.English – Thanks again to Caroline Dwight, I’ve got my seniors creating memorable images for the quotes they want to remember come exam time! 3. Media: Amazing site with free movies. The post about wikipedia last week provoked a lot of comment online about the reliability of wikipedia. It was an interesting discussion and ultimately we agreed that like all resources you just have to filter the information you find and make sure you can back it up with other sources. As I meandered through wikipedia I did find this little gem on velociraptors though. 1.Math-Scale: I have been suckered into thinking that velociraptors were these imposing, pack-hunting dinosaurs….turns out they are just aggressive turkeys…. 2. Presentations: My thanks to Carolyn Dwight, the SCT from Otumoetai College who kindly sent me some sites that I could use for this blog. I’m not going to use them all at once, I will drip feed them out! This one was a cracker and came just as I was looking for a good tiger roar sound (I’m building a ppt for Life of Pi, Richard Parker needs to be seen AND heard). 3.Research/History I apologize in advance for the time I am about to steal from you. Enter this website at your own peril (especially Historians). It’s just a trove of fascinating articles and essays. The Wikiverse! 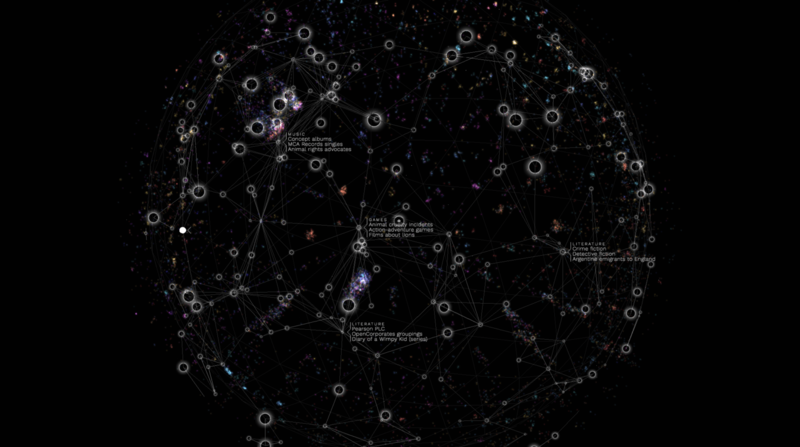 Research: If the thought of recklessly clicking through hundreds of Wikipedia entries at a time no longer floats your boat, here is a new immersive way to drift through a galaxy of wiki links like Han Solo in the Millenium Falcon. Built by Owen Cornec. Wikiverse is a cosmic web of information. To access any entry on Wikipedia, simply click on a star and Wikiverse will pull up the information for you. 2. Economics: It would seem that the time has come for hoardings to go up and for the politicians to brush off their best baby kissing lips. Thanks to colleague Jo McDowell (Economics) for this site [put together by ex-student of Tonia Calverley]. With the elections fast approaching it’s pretty appropriate! 3. Media: Ads from the past. colleague Rebecca Trethowen. I immediately searched for the old Hugo and Holly KFC ad…remember that one? “Hugo said you go, and I said no you go, and soon he was back, with a pack and then Dad hit the track and so we ate in the back feeling better inside……”….those kids were politically incorrectly fat on the grease of Kentucky Fried Chicken! Three amazing sites today that really do what the internet was set up for. They archive material. Or what about this one….any guesses what it pertains to?